Too Sisters Designs is made up of two true-life sisters - Tisha Kuntz and Carolyn Hotchkiss. Born and raised in Illinois, of the two, Tisha was considered the artistic one. Though not viewed as an artist in the conventional sense, Carolyn realized that she had a keen eye for color. Both agree, "Our abilities appear to be complementary and we each build on the other's strengths." Their mother taught them both embroidery and tried her best to teach them crochet, albeit with less success! As their education was primarily academic, their creative output is a result of their parent's unstinting encouragement for them to be independent, try new and different things and not hesitate in pouring energy and passion into their pursuits. This prompted Tisha to dabble in watercolors, oil and acrylic painting and sculpting with clay. Carolyn engaged in making hand-made cards using rubber stamps, pastels, inks and other techniques. Carolyn also applied herself to various types of needlework throughout high school, concentrating on crewelwork, appliqué projects and clothing embellishment. Once in college, the time for such pastimes evaporated, until she retired from nursing in 1995 and at long last found herself with some free time. She decided to take up the needle once again. While searching for a crewel kit to start on, Carolyn discovered and quickly got hooked on counted cross-stitch instead. But since she has always been drawn to bold and bright colors, she found most of the designs available too subdued for her taste. 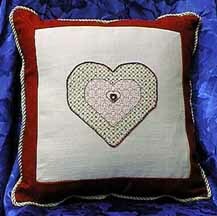 It had been years since either Tisha or Carolyn had engaged in needlework and in the interim many things had changed. Carolyn reminisces, "Back in the 1970's, there was such a wide range of styles, colors, techniques and so much to choose from. It almost seemed like a new dawning of experimentation with color and texture. The 90's seemed to leave us with fewer choices in color, style and those elusive aspects of design that make stitching fun. To try and recapture that sense of color and excitement from before, we started designing pieces that were bright, had a sense of whimsy, used bold colors in very different ways." What really set them firmly on the path of designing as a career was a fateful contest entry. They elaborate, "'North by Loch Ness' [their contest entry] really started it all. We felt it gave us a good strong push into designing as a profession. Working together was something we'd always dreamed of doing, and we felt confident we'd be compatible enough to give our business endeavor a fair chance." They had also heard some very compelling success stories from other designers, whose careers had begun with just a dream, backed up with plenty of determination. Coupled with all the positive feedback Carolyn and Tisha received after winning the Design Contest, the timing couldn't have been more propitious. Virtually anything and everything provides inspiration for Tisha and Carolyn, which means ideas are flying fast and furious all the time! Tisha adds, "We both tend to look at everyday things in unorthodox ways. Colors have such energy, which is why we're so fond of vibrant hues; textures also play into this too, with beads, metallics and buttons finding their way into our projects." And don't forget, all this is multiplied by two, so they literally never run out of ideas! Too Sisters definitely gravitate to using bold, bright colors within a relatively simple format. They are currently inspired by the late 60's and early 70's, stating, "We joke that we're the 'acid rock designers of cross stitch,' but don't let that fool you. We're contemporary and we've been told there's a little something for everyone in our design line." They are also venturing toward a new look - perhaps a foray into the sampler genre, but in keeping with their preferred color palette. One look at their design collection speaks for its incredible diversity of subject, style, color and pattern. 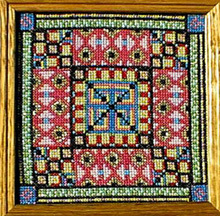 Having experimented with numerous other crafts, Too Sisters often incorporate elements of these into their designs. 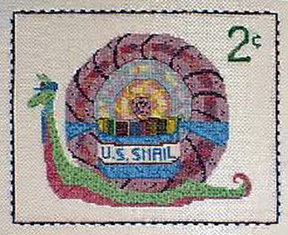 Just as some chefs specialize in "fusion" cuisine, they are intent on exploring unique ways to mix needlework with other media. 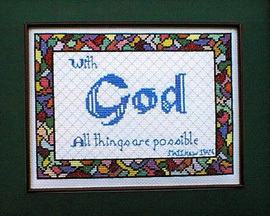 Too Sisters design mostly in cross-stitch, but have been moving into embroidery and charted needlepoint design recently. Plans are afoot to integrate these techniques into future work, as they have done with their Free Pattern, Winged Wonder, which was designed exclusively for this month's website. Being sisters, the initial design process can be loud and boisterous, but is also a time for compromise and teamwork. It's truly uncanny how they can often visualize the same thing and instinctively know how the design will progress. A new idea finds Tisha drawing the design just as fast as both of them are describing it, in a jumble of half-thoughts, while finishing each other's sentences in that strange "sisters' shorthand." Carolyn always stitches the first model of each design, because a bit of tweaking is usually called for. Besides being a very fast and adept stitcher, she isn't afraid to tackle anything, from metallics to beads and everything in between. 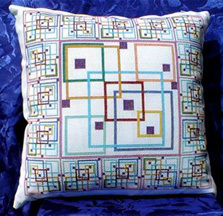 Her fearlessness in stitching is certainly equal to her sister's bold strokes and innovative twists with their designs. Tisha makes final corrections at the computer, once the initial model has been stitched. 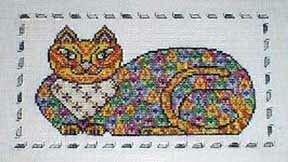 Once the master chart is completed, other stitchers complete models as needed. Some are enlisted, (most notably their mom, Mimi Atkinson), while others volunteer and look forward to being among the first to see and stitch their work. Carolyn's husband, Peter, photographs the finished pieces and helps Tisha with website duties. His expertise and constant encouragement of their new venture have been invaluable to them both.